After a short break back at my room, I am now refreshed and ready to see some more demo rooms. Whammerdyne is known for its very high-end low-output power amps. On display was what they call “The World’s Finest 2A3 Amplifier,” the DAA3+ RAM 22A3 ($6,900). By the way this is short for Damn Awesome Amplifier + Remote Advanced Magnetics. Have to admit it was pretty cool. They also had an MSB Technologies “Analog” DAC ($7,000) and Exogel Comet DAC ($3,000). They were using Tidal for streaming, so I couldn’t use any of my music. 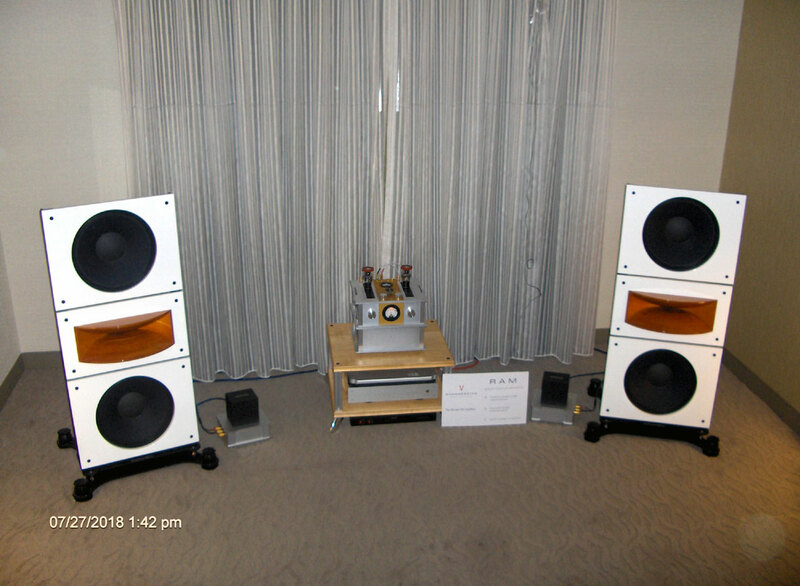 PureAudioProject was showing its Trio15 Horn 1 ($7,000/pr), with dual 15” woofers and a stunning wood horn tweeter. I have never been a huge fan of 2A3 amps, as I find them overly soft, often somewhat fluffy in character and rarely have realistic bass dynamics, but I have to say this system was not like the typical 2A3 amps I have listened to in the past. Even with the digital front end and streaming music, the imaging was very precise, with a deep sound stage and full bass. 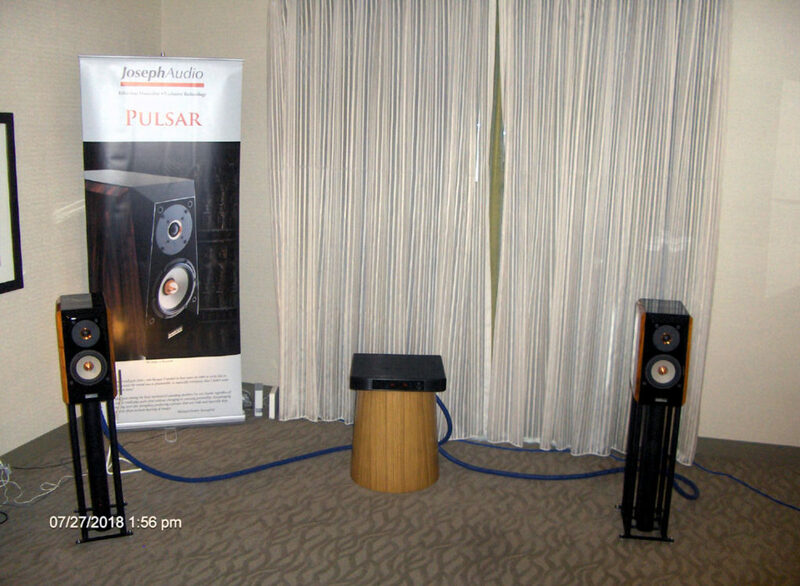 Joseph Audio had one of the simplest room systems and in my mind the most appropriate high-end system considering the room size. They were displaying their Pulsar speakers, small monitors with a SEAs180mm cast frame woofer and 1” silk dome tweeter ($7,700/pr). 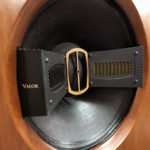 Company founder Jeff Joseph explained that the speaker uses an infinite slope designed crossover. The intent of the design is to eliminate many of the intrinsic problems found in conventional crossover designs. I have done speaker design for over 50 years and over that time have run into several innovative crossover designs and intend to do more research into the infinite slope concept. 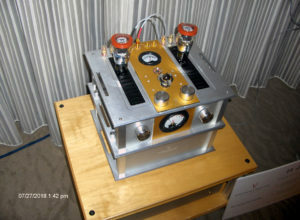 The remainder of the system consisted of a Bell Canto Black EX ($15,000) integrated amp. They were also streaming their music. Sonically, the music emerged from a black background and completely filled the room wall to wall. 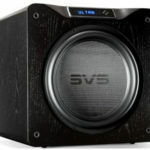 The bass was very fast and detailed plus it gave you far more low end than you would expect from such a small speaker. It reminded me a lot of Phil Jones Platinum Reference One speakers from the late 1990s. I really enjoyed this system, it just worked great in the room. The Studio Electric/Wyred 4 Sound room had their SE FXS dual 6.5” 2-way towers with a side firing 8” passive driver ($10,500/pr.) 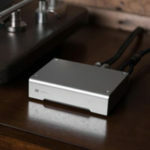 driven by a Wyred 4 Sound MS2 server ($3,700) into a DAC1N2 DAC ($1,299). Power came from their STI-1000 500W-per-channel Class “D” integrated amp ($2,499) I appreciated the Pro-Ject RPM-5 table with Sumiko’s new Amethyst cartridge ($1,500 package). Wired 4 Sound is a direct-to-market manufacturer offering all in-house production in Atascadero, California. This was my first opportunity to hear Sumiko’s newest moving magnet cartridge. The Bill Evens Trio in “Portrait in Jazz” was very convincing. 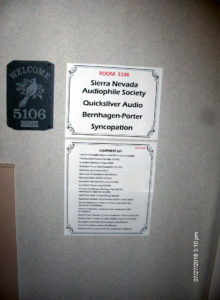 Imaging was good, mids were smooth and bass was clean if not extended, but that may be because of the room conditions. I think room treatment would have really helped them to solve their issues. Maybe next time they will consider adding room treatment. 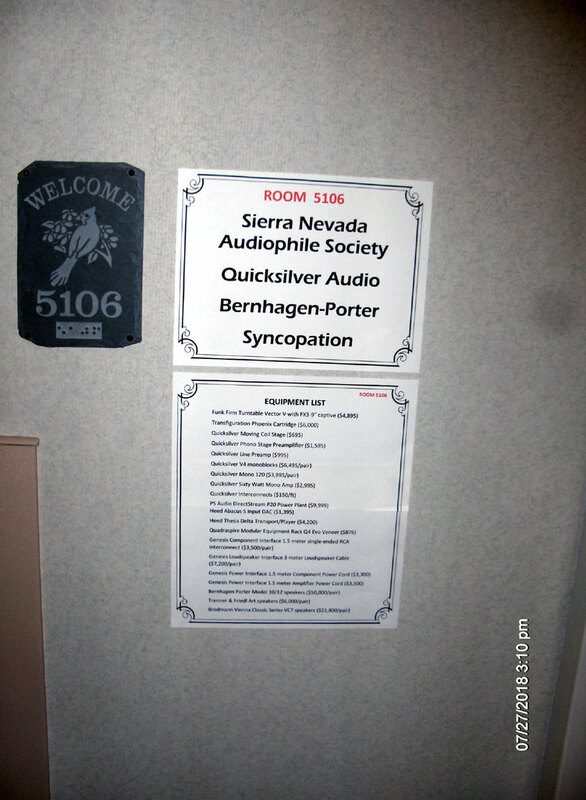 I have to first say that I have a personal bias for Quicksilver Audio. I have known Mike Sanders for an obscene number of years and have sold more than my share of his electronics over the last 30 or so years. This is the first time in about 20 years that he has attended a show. He has been represented in dozens of shows, but never makes a public appearance, so this was a real coupe for Constantine, Dagogo’s publisher and CAS owner. I always enjoy my chats with Mike. 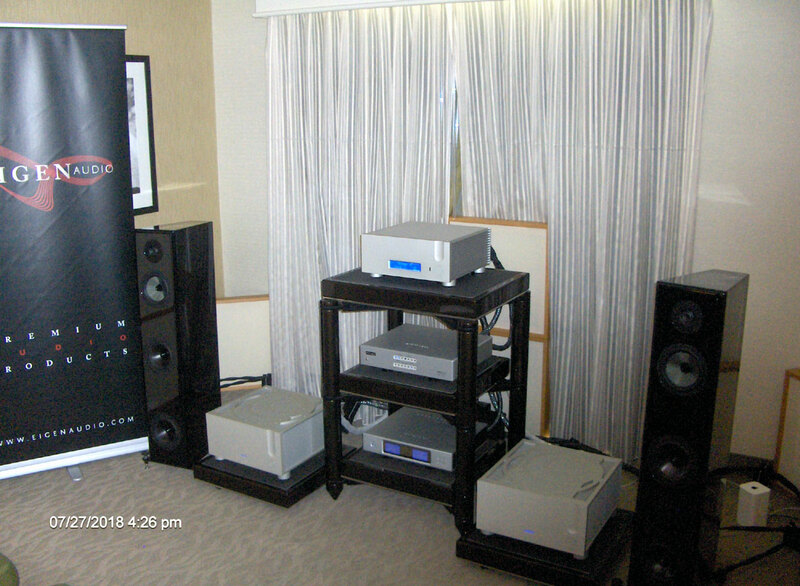 He was showing with Bernhagen-Porter Speakers powered by the Quicksilver 60W mono block amps ($2,995/pr. ), Line Preamp ($995), with their Phono Stage Preamp ($1,595) and their Moving Coil Stage ($695) all sitting in front (or behind) a Funk and Firm Vector V Turntable ($4,895) with a Transfiguration Vector V cartridge ($6,000). On the digital side was a Heed Thesis Delta transport ($4,200) with a Heed Abacus DAC ($1,395). 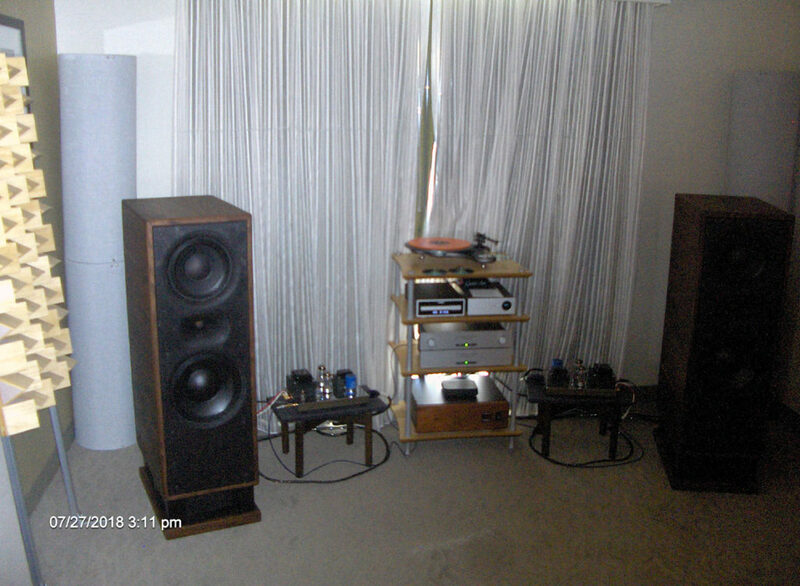 Everything played into a pair of Bernhagen-Porter model 10/12 speakers ($50,000/pr). My Usher demo CD showed off the speaker’s excellent low-end performance. The system proved how truly excellent and affordable tube electronics can maximize the performance of extremely high-end speakers. Quicksilver has some of the quietest noise floors of any tube design, with a lushful and musical sound. I could go on and on about the performance of the system. Suffice to say the sound was excellent across the board. Unisinger USA is a local company, based in Cupertino, California, with manufacturing in China. 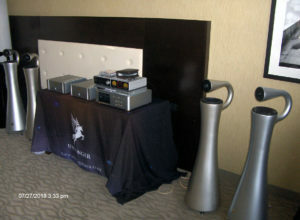 On display were three models of their speakers. I had the opportunity to listen to their system including their Platinum speaker which consists of a down firing 10” woofer, 6” up firing midrange and a ¾” front firing tweeter mounted on a goose neck mechanism sitting above the midrange (28,000/pr.). They were driven by a JF Digital Server into their own Model U-150, 150W/ch power amp. The Unisinger speakers are one of the more unusual designs. 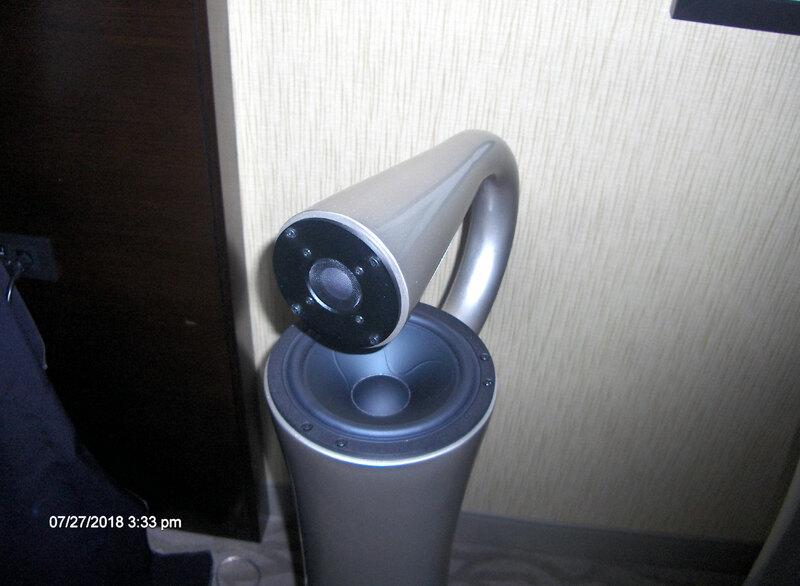 They obviously spent an inordinate amount of time and money engineering these speakers. On first impression, the speakers appear to me more flash than function, but in spite of their unusual appearance they sound open and musical. 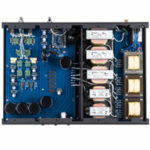 Eigen Audio is a Bay Area audio specialist dealer based in Soquel, California, outside Santa Cruz. They represent all the lines they were showing at the show. Electronics were the Ypsilon PST-100 MKII preamp ($37,000), Ypsilon Aelius II Monoblock amplifiers ($39,000), and EMM Labs DAC2X v2 DAC ($15,000). 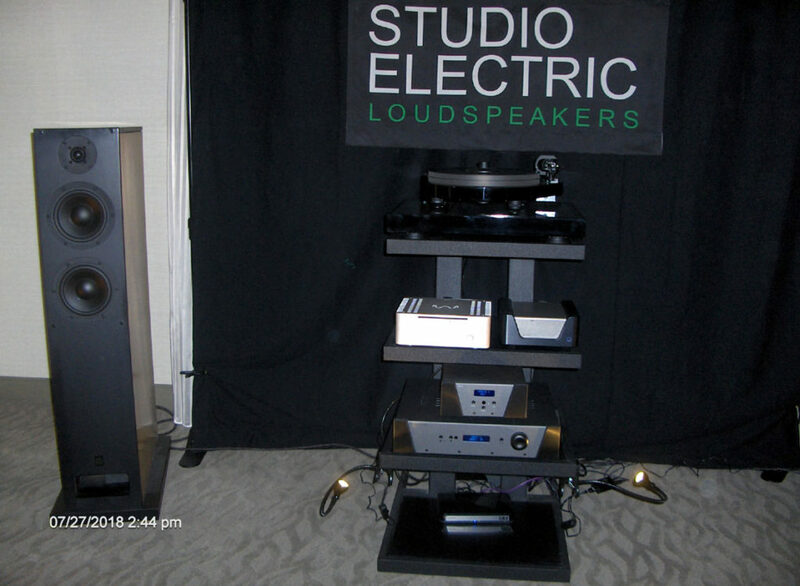 The speakers come from one of the country’s renown speaker designers, Albert Von Schweikert. His E3 MKII. They use two 175mm anodized aluminum coned woofers, 165mm Kevlar coned high performance midrange and a Dual Ring Radiator tweeter. Like the MartinLogan room, the source was an Aurender N10 Streamer. Bass was very tight, clean and extended. Mids were smooth, well defined, with a deep sound stage. The ring radiator is one of the best dome tweeters on the market with an excellent reputation of being open and detailed. It is used in some of the finest speakers on the market including Von Schweikert. The clock is approaching cocktail time, and I decided to call it a night. I look forward to what tomorrow has to offer. A good part of what you’re hearing in the Joseph Audio room can be attributed to the Bel Canto Black EX integrated. It’s an outstanding piece that does indeed drive the bottom end really well. Nothing has brought out the bottom end on a pair of ATC SCM40 quite like this integrated.